Twenty designers put on their inventive caps to come up with 40 charming, unique, and even dramatic aviary designs in The Ultimate Birdhouse Book. Some work with wood and gourds; others begin with manufactured cedar birdhouses. All end up with results that will be the talk of the telephone line. 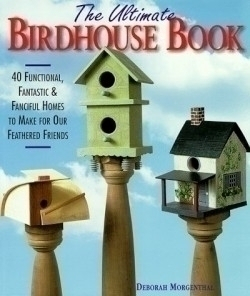 The best example of this is the Carolina wren house. Designer Robin Clark provides a simple floor plan to create this cedar classic. Then seven other artists step in to modify the house with paints, stain, bits of vine, carving knives, and even old gardening tools to turn that plain Jane into seven different showpieces. For the indoor set, the book includes instructions for a lamp, CD cabinet, and clock that begin with store-bought boxes. Add gold leaf and a little magic to come away with unforgettable designs. The hardcover book includes complete materials and tools lists for each design and step-by-step instructions for each house shown. Most of the work could be attempted by a beginner. None of the patterns looked too difficult for an experienced craftsperson to wing on his or her own. Best yet, this book truly is for the birds. Not just any box with a hole in the front will do. Wrens, nuthatches, bluebirds and the like are finicky about where they nest. Morgenthal includes nesting box dimensions, including preferred hanging heights and locations for 26 different species-enough to give a backyard enthusiast a chance at inviting something other than English sparrows. Also, most of the houses are hardy enough for outdoors, and some designs include hinged doors to clean out the nestingboxes each season, important for upkeep.